The Best Green Swiss Enchiladas! 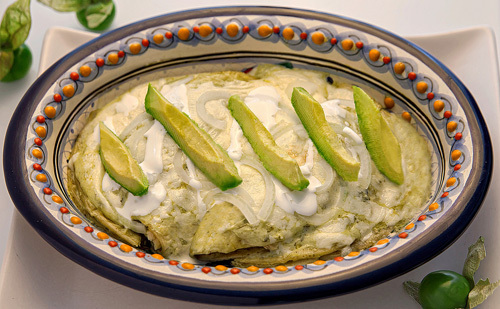 Among the numerous varieties of Mexican enchiladas are found the Swiss enchiladas, so called because they are covered with melted cheese, cream and onion . Ingredients that seem to associate with the delights of the Alps. In the Mexican cuisine it sounds strange to have an authentic Mexican dish, which is named with the word “Swiss". The legend says that the Swiss enchiladas are so named because when Walter Sanborn (founder of Sanborns) came to Mexico and saw this dish so white, he said that it reminded him of the snow of the Swiss Alps. Although in this main course there is more, lots more... because underneath all that white cover lies a green salsa layer that baths some tortillas filled with shredded chicken – best known as enchiladas. Now imagine the flavor of this dish that combines so many ingredients. The creaminess and delicacy of the cheese and the cream are merged with the acid and spicy touch of the green salsa. Then the precise flavor of the maize along with the delicate flavor of the chicken make all this dish an exquisite mixture, to which it cannot be resisted. This is a recipe that is made in many stages, so get ready because there is a lot of work to do. It is very important to use a cheese that melts in these enchiladas. We recommend the Manchego cheese, Chihuahua cheese, Oaxaca cheese, etc. We give the recipe with 2 serrano peppers although the chilies quantity can be adjusted to your liking. Prepare the corn tortillas that are used in these enchiladas so your dish has more freshness. The preparation time is of 45 minutes . The recipe is for 10 Swiss enchiladas. Clean 2 chicken breasts and put them in a saucepan. The enough Water to cover the chicken breasts. When it boils cover the saucepan and leave the chicken cooking in the boiling water for about 20 minutes, until it is well cooked. 3/4 of a cup of Mexican Cream (6.3 fl oz). Take from the saucepan the chicken breasts with the kitchen spoon, wait until they cool a little and shred them; then set aside. Don’t throw away the broth that was obtained from cooking the chicken because it is very tasty and you can use it to prepare a soup. Put in a baking dish the fried tortilla with salsa and put over the tortilla some of the chicken that was shredded. Slice 1/4 of an onion (1.3 oz), then reserve. Put over the green enchiladas with chicken 1 cup of grated cheese that melts. Put in the oven the baking dish and leave the Swiss enchiladas baking for about 10 minutes, until the cheese has melted. 1/4 cup of Mexican Cream (2.1 fl oz). The Onion slices that were cut. * Serve the Swiss enchiladas fresh from the oven so the delicacy of the melted cheese can be appreciated . Variation: Sooner or later you also have to try the red enchiladas. Did you like the Swiss Enchiladas? Although this serrano peppers are canned they have a good consistency, very good flavor and a fabulous hotness – ideal for these enchiladas.